© YE AUNG THU/AFP/Getty Images Myanmar State Counsellor Aung San Suu Kyi speaks at the World Economic Forum on ASEAN in Hanoi on Sept. 13, 2018. Myanmar’s de facto civilian leader Aung San Suu Kyi on Wednesday defended a court’s decision to sentence two Reuters journalists to seven years in jail last week in a trial widely seen as farcical and a major setback for free expression in the country. The pair, she said, “were not jailed because they were journalists” but because an “open court” has decided they broke a colonial-era secrets act. The judgment handed down by the Myanmar court against the two journalists had “nothing to do with freedom of expression at all,” Suu Kyi said, speaking at the regional World Economic Forum meetings in Hanoi. Wa Lone, 32, and Kyaw Soe Oo, 28, were detained in December and prosecuted and sentenced under the colonial-era Officials Secrets Act. The law, which press watchdogs say has works to muzzle independent reporting, punishes anyone who obtains state secrets and intends to share them. At the time of their arrest, the two journalists, both Myanmar nationals, were working on an investigation into the killings of 10 Rohingya Muslim men at the hands of the Myanmar military and Buddhist militants, during a broader crackdown on the minority group that has sent almost 800,000 fleeing to neighboring Bangladesh. They say they were simply doing their jobs as journalists. 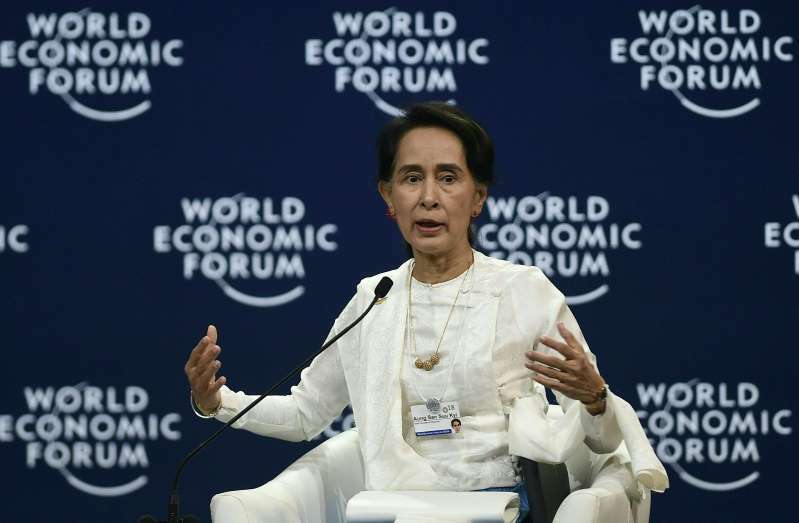 Suu Kyi, in her comments at the World Economic Forum, challenged critics to read the judgment against the two journalists, which she said she has. The judgment states that Wa Lone and Kyaw Soe Oo had obtained the documents with the intention of sharing them with militant and “terrorist” groups in Rakhine state. Defense lawyers for the pair said the assertion was “pretty ridiculous” and that the journalists were acting within the law. The two journalists could appeal their case, she added. But many had been hoping that Suu Kyi — a Nobel laureate who was a darling of the press when she was under house arrest at the hands of Myanmar’s military generals — would use her power as the de facto leader of Myanmar’s civilian government to grant them a pardon. Both men have young daughters. Wa Lone’s wife, Pan Ei Mon, gave birth to a baby girl in recent weeks while her husband was in jail. Speaking last week at a press conference after their sentencing, Pan Ei Mon said she was disappointed in Suu Kyi, who had previously made similar comments about the journalists breaking the law.